Flowers are an integral element to a wedding day so it makes sense that many couples will choose a wedding invitation that contains flowers. There is something uplifting and optimistic about fresh flowers and there is a correlation between a blossoming relationship coming into flower and the flowers that are in bloom. 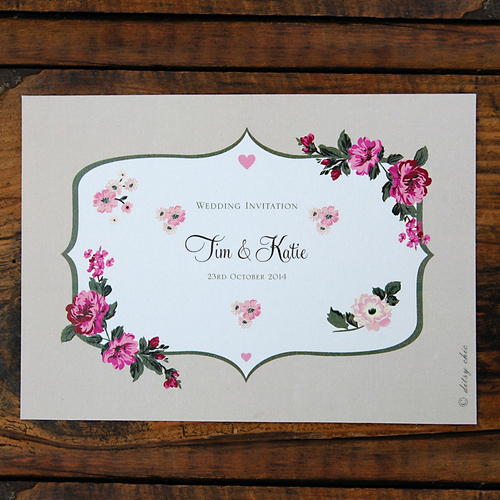 No matter what sort of wedding you are having, it is likely that flowers will be present at every step of the big day, so if you want a wedding invitation that is suitable all year round and for all weddings, the fancy florals wedding invitation by Ditsy Chic makes great sense. There is a touch of class and elegance about this invitation and many people feel that it encapsulates the style and sophistication you would expect from a high class garden party. If you want to recreate this feeling for your big day, or there is an outdoor element to your wedding or reception, you will find this stylish card is the perfect way to do so. There are a number of colour combinations involved with the design and you can personalise the invitation to suit your own colour scheme. There is flexibility with respect to the design of the invitation and you can opt to have the invitation in a postcard style or in a more traditional card style. Both of the different styles are finished to the same high quality, so it all depends on the style that you prefer. There is a range of wording available for users to select but it is also possible to create your own customised invitation so no matter what you want to say to your guests, you can say it with flowers in style. Tags: Blossom, Garden Party, Sophisticated.